The Arabic television station said the video, aired late Thursday just days before the fifth anniversary of 2001 atrocities, "included scenes showing for the first time Al-Qaeda leaders preparing the September 11 attacks and practising for their execution." 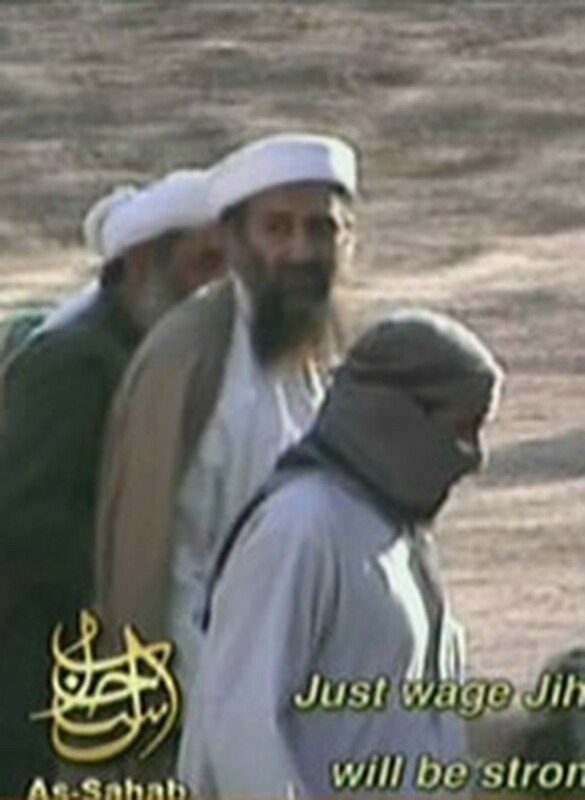 The Al-Qaeda chief, wearing a white turban and white and brown robes, is shown in the company of several dozen men, walking in a barren, rocky area that was not identified. Al-Jazeera also showed images of two of the 19 Islamist militants who died in the attacks, Saudi nationals Hamza el-Ramdi and Wael el-Shehri. According to Al-Jazeera, the footage showed suspected September 11 coordinator Ramzi bin al-Shaiba with Bin Laden who was telling his men "Prepare for the invasion, America is going to invade Afghanistan." The Qatar-based station said it only aired a small part of the full video which lasted about an hour and a half and was made by a group called Al-Sahab which specialises in recordings of Al-Qaeda and other Islamist militant groups. Bin Laden, the Western world's most wanted man who has a 25 million dollar bounty on his head but has eluded a vast manhunt and his whereabouts are still unknown. Almost 3,000 people died on September 11, 2001 when suicide hijackers took control of US airliners, slamming two into the twin towers of the World Trade Centre in New York, causing them to collapse. Another plane hit the Pentagon, the US military heaquarters building near Washington, and the fourth crashed in a field in Pennsylvania. Fifteen of the 19 hijackers on September 11 were Saudi nationals. The footage aired by Al-Jazeera showed hand-to-hand combat training between people who wore masks over their heads, and one of whom was armed with a knife. Later Thursday, the US Senate unanimously approved an additional 200 million dollars to this year's defence budget to fund an intelligence unit that would seek to hunt down bin Laden. "Osama bin Laden, the head of Al-Qaeda, planned, financed and organized a terrorist operation that killed thousands of Americans. It has now been more than 1,800 days since those attacks, and this man is still on the loose," said Democrat Kent Conrad. Al-Jazeera also broadcast a recording attributed to the shadowy head of Al-Qaeda in Iraq, Abu Hamza al-Muhajer, in which he forecast victory against US-led forces in the country. The recording, the first time Muhajer has spoken publicly since taking over as head of the group, was also posted on an Islamist Internet site, but its authenticity could not be established. Muhajer, who succeeded slain Al-Qaeda frontman Abu Musab al-Zarqawi after he was killed in a US air strike in Iraq in June, urged Sunni Muslims to kill at least one US citizen within the next two weeks. "Oh followers of (Taliban leader) Mullah Mohammed Omar, oh sons of Osama bin Laden, oh disciples of Abu Musab al-Zarqawi ... I urge each of you to kill at least one American within a period not exceeding 15 days," Muhajer said. "I do not doubt victory for an instant," in reference to the group's fight against US-led forces in Iraq, he said in Thursday's video. Muhajer also called US President George W. Bush a "liar" and a "dog". "Do not be proud of the number and the equipment" Muhajer said. "The war has just begun." Shiite Muslims were also targeted, and referred to by the derogatory term rafidha (people who reject Sunni dogma). "I call on every free Sunni whose father, brother or family member was killed or captured... by the rafidhas, to kill a rafidha," Muhajer said, telling Shiites "to repent and return to your senses". The insurgent leader also had harsh words for Sunnis who participated in the Iraqi political process, and members of the Iraqi Islamic Party in particular. Muhajer addressed a "message of fidelity" to bin Laden, Omar and Al-Qaeda deputy Ayman al-Zawahiri, promising to "pursue the same path of jihad" or holy war. Mujaher's nationality is the object of some discussion, with US officials believing him to be an Egyptian by the name of Abu Ayub al-Masri. But according to Yasser al-Sirri, director of the London-based Islamic Observation Centre, Mujaher is an Iraqi by the name of Sheikh Abu Hamza al-Baghdadi.